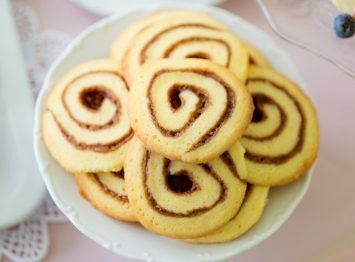 I love these nut and date pinwheel cookies. They are pretty on the plate and pack a delicious taste. Don’t let the pinwheel shape fool you into thinking these cookies are difficult. Just roll out the dough, spread the filling on the dough, roll them up and slice them before baking. That’s it! If you are looking for good holiday cookie recipes, add these date cookies to your mix. They are easy, store well and look great on a plate mixed with other holiday treats. Of course it doesn’t have to be the holidays to enjoy these date cookies. They are a great any time cookie. In another bowl, beat the butter until it is light in color, gradually adding the sugar. Add the egg and vanilla and continue beating the mixture until it is very light and fluffy. Add half the flour beating it in; then add the rest with your hands to form a stiff dough. Refrigerate the dough for one hour before rolling it out to harden it a bit. While the dough is cooling in the refrigerator, make the filling: Combine the dates, sugar, and water in a pot. Cook the date and sugar mixture, stirring, over medium heat until it is thick, about five minutes. Remove from the heat and add the nuts and lemon peel. Let it cool before using. When the dough and filling have cooled, divide the dough in half. Roll each half into an 8" x 10" rectangle. Spread each rectangle with half of the date nut mixture. Roll each rectangle jelly roll fashion and gently press the end edge to seal. Wrap in foil or waxed paper and refrigerate until firm, preferably overnight, before baking. Preheat the oven to 375°F and lightly grease one or two cookie sheets. Cut the dough into 1/8 inch thick slices and lay them on the cookie sheets. Bake for 8 to 10 minutes or until they are lightly browned on the bottom but still fairly white on the top. Let the cookies stand for one minute before removing them from the pan to cool on a rack. Yield: Over 100 cookies. Rolling the cookies from the short end will result in fewer cookies that are a bit larger. If you roll the dough up from the long end, you will have more cookies, but they will be fairly small. Your choice. You really do need to cool down both the dough and the filling before you make the cookies. If you don’t spreading the filling and rolling the cookies will be difficult and could result in pretty ugly little pinwheels. The recipe calls for “sifted” flour. For those of you who are not experienced bakers, sifting flour means to pour it through a sifter to add air to the flour and break up clumps. It results in a lighter cookie, or whatever you are baking. If you don’t have a sifter, it’s the same as a mesh strainer, so you can use that instead. Of course, sifting the flour isn’t necessary so don’t worry about it if you decide not to do it. Please Note: The nutritional information software I use didn’t allow me to input a yield over 72, so please know that the cookies will be lower in calories and everything else than is shown in the diagram above. And dates and nuts are both good for us, so if you are going to eat cookies, these are an fairly healthy choice. You will find all of our cookie recipes here. If you love dates, you’ll have to give our date square recipe a try. If you like this recipe, please take a moment to Pin it to Pinterest, Tweet about it, Like it on Facebook and leave a comment below. I really do appreciate it. You can add your own recipe below in the comments section. I would love to help you share your creations with the world.